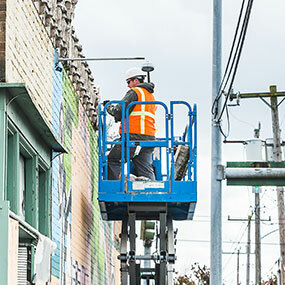 Whether you're working on or with a boom lift, cherry-picker or scissor lift - aerial lifts present significant and life-threatening risks associated with falls as well as with heavy, mobile machinery. 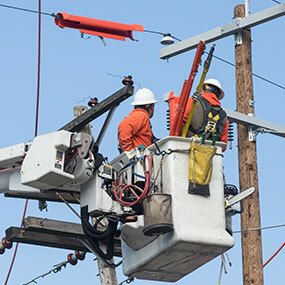 We help Aerial Lift Dealers lower the true cost of their risk by focusing on a comprehensive insurance program, supported by OSHA approved training and rental contract review. Please note this program is only for equipment rental companies. Specializing Insuring Aerial Lift fleets for over 40 years! 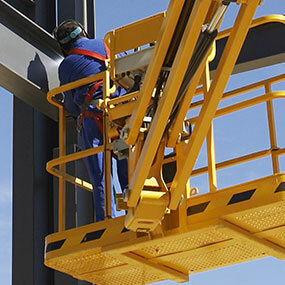 Our Aerial Lift insurance experts recognize the direct correlation between the prevention of losses and the costs associated with Insuring your Aerial Lift Fleet. The installation of the OEM Controls, VertAlert Lanyard Attachment Warning System will help support your companies current safety training program and compliance with OSHA regulations and ANSI Standards. The addition of the VertAlert LAW System onto your Aerial Lift Fleet should correlate to a considerable savings on Workers Compensation, Liability and Umbrella Insurance Premiums. Our comprehensive aerial lift insurance program is built exclusively for the needs of aerial lift equipment rental dealers and sales centers. We offer an A+ comprehensive property and casualty insurance program underwritten by a national insurance company. Ensuring your contracts are protecting your assets and that the correct "hold harmless" wording is in included. Proactive safety is essential for all employees working with your equipment. Our capabilities also include general liability, property, inland marine, automobile workers’ compensation, surety and employee benefits. With our speciality program, dealers can obtain a majority of their commercial insurance coverage from a single, reliable source. By having on team handle all insurance coverage needs, streamlines the insurance process and enables our team to see and fill coverage gaps. Our single solution approach reduces the number of renewal dates, making plan administration less of a burden for the client. Speak to an aerial lift insurance expert today!